By Keith Cowing on March 25, 2019 12:02 AM. "On Tuesday, March 26, 2019, at 12:00 p.m. CDT, Vice President Mike Pence will chair the fifth meeting of the National Space Council at the U.S. Space & Rocket Center in Huntsville, Alabama. 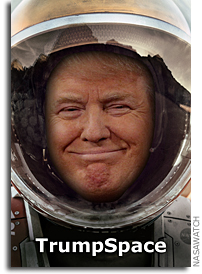 This meeting will focus on President Trump's plan to restore American leadership in space and the next steps in implementing his vision to send Americans to the moon, Mars, and beyond. As chairman of the Council, Vice President Pence will convene the meeting, receive reports from Council members, hear from two expert panels on human space exploration, lead a Council discussion, and present policy recommendations for the President." Keith's note: If you look at the agenda you will see that this is yet another short meeting of the usual suspects who will read pre-prepared statements that echo what others have said at previous NSpC events - and what has been said in front of innumerable blue ribbon panels for decades. In the end there will never be crisp findings nor enough funding to accomplish whatever this panel wants NASA to do. These people really need to focus on specific, realistic deliverables - not buzz words strung together. Otherwise its just more choir practice in an echo chamber. "AIAA's executive director emeritus, Sandy Magnus, who's also a former NASA astronaut, will sit on the first panel, "Ready to Fly," which includes AIAA Associate Fellow Col. Eileen Collins, U.S. Air Force (ret. ), former NASA astronaut and the first female Space Shuttle commander, and Gen. Lester Lyles, U.S. Air Force (ret.) and former Vice Chief of Staff of the Air Force. The "Ready to Explore" panel will feature two AIAA members: Dan Dumbacher, AIAA executive director, former Purdue University aerospace engineering professor, and NASA (ret.) Deputy Associate Administrator, Exploration Systems Development Division, Human Exploration and Operations Mission Directorate; and AIAA member Wanda Sigur, former vice president and general manager of Lockheed Martin Space Systems. Jack Burns, University of Colorado Boulder, also will participate in the panel." All we see at this event are people who represent the status quo in big aerospace and government. And to reinforce this bias, AIAA, the big organization for Big Aerospace with a built-in revolving door, wants everyone to know that they have multiple members presenting at this meeting i.e. the deck is stacked in favor of the status quo. Where are the 20-and 30-something people who are entering the space workforce - the ones who ought to have a say in where things are going? Every speaker is over 50. Many are over 60. This is not new. The whole NSpC/UAG thing is like this. "Have a look at the National Space Council User's Advisory Group meeting agenda. Not a single person who is speaking is actually a "user" of space - they are either big Aerospace Reps, politicians, government employees, or reps from other advisory bodies. There is no "user" input in evidence." During the public input section of the meeting I asked how many UAG members are actually users and how many are sellers and noted that no one on the committee really seemed to be speaking for the next generation of space explorers. The chairman responded: "Users are defined in the broadest of sense so we are all users." He said he "appreciates my continued interest" in what they are doing or something. In other words go away with your actual questions. Fifth Meeting of the National Space Council March 26 in Huntsville\n\n\"On Tuesday, March 26, 2019, at 12:00 p.m. CDT, Vice President Mike Pence will chair the fifth meeting of the National Space Council at the U.S. Space & Rocket Center in Huntsville, Alabama. This meeting will focus on President Trump's plan to restore American leadership in space and the next steps in implementing his vision to send Americans to the moon, Mars, and beyond. As chairman of the Council, Vice President Pence will convene the meeting, receive reports from Council members, hear from two expert panels on human space exploration, lead a Council discussion, and present policy recommendations for the President.\"\n\n Keith's note: If you look at the agenda you will see that this is yet another short meeting of the usual suspects who will read pre-prepared statements that echo what others have said at previous NSpC events - and what has been said in front of innumerable blue ribbon panels for decades. In the end there will never be crisp findings nor enough funding to accomplish whatever this panel wants NASA to do. These people really need to focus on specific, realistic deliverables - not buzz words strung together. Otherwise its just more choir practice in an echo chamber.\n\nAIAA Members to Speak at National Space Council Meeting on March 26\n\n\"AIAA's executive director emeritus, Sandy Magnus, who's also a former NASA astronaut, will sit on the first panel, \"Ready to Fly,\" which includes AIAA Associate Fellow Col. Eileen Collins, U.S. Air Force (ret. ), former NASA astronaut and the first female Space Shuttle commander, and Gen. Lester Lyles, U.S. Air Force (ret.) and former Vice Chief of Staff of the Air Force. The \"Ready to Explore\" panel will feature two AIAA members: Dan Dumbacher, AIAA executive director, former Purdue University aerospace engineering professor, and NASA (ret.) Deputy Associate Administrator, Exploration Systems Development Division, Human Exploration and Operations Mission Directorate; and AIAA member Wanda Sigur, former vice president and general manager of Lockheed Martin Space Systems. Jack Burns, University of Colorado Boulder, also will participate in the panel.\"\n\nAll we see at this event are people who represent the status quo in big aerospace and government. And to reinforce this bias, AIAA, the big organization for Big Aerospace with a built-in revolving door, wants everyone to know that they have multiple members presenting at this meeting i.e. the deck is stacked in favor of the status quo. Where are the 20-and 30-something people who are entering the space workforce - the ones who ought to have a say in where things are going? Every speaker is over 50. Many are over 60. This is not new. The whole NSpC/UAG thing is like this.\n\nSpace Council Users' Advisory Group Meets Without Any Users, earlier post\n\n\"Have a look at the National Space Council User's Advisory Group meeting agenda. Not a single person who is speaking is actually a \"user\" of space - they are either big Aerospace Reps, politicians, government employees, or reps from other advisory bodies. There is no \"user\" input in evidence.\"\n\nDuring the public input section of the meeting I asked how many UAG members are actually users and how many are sellers and noted that no one on the committee really seemed to be speaking for the next generation of space explorers. The chairman responded: \"Users are defined in the broadest of sense so we are all users.\" He said he \"appreciates my continued interest\" in what they are doing or something. In other words go away with your actual questions. This page contains a single entry by Keith Cowing published on March 25, 2019 12:02 AM. Why Is NASA Blurring These SLS Photos? (Update) was the previous entry in this blog. CASIS Has Some ITAR Staffing Issues is the next entry in this blog.